Picnic Plus - The full thermal foil insulated lower section holds up to an 11" x 15" 5 QT casserole dish not included. The full thermal foil insulated lower section holds up to an 11" x 15" 5 QT casserole dish not included. Made of durable 600D polyester. Hidden pocket stores utensils. Durable and stylish, designed in USA, made with premium quality components and material with Lifetime guarantee. Dimensions: 18"w x 11"d x 8"h / 3 lbs. 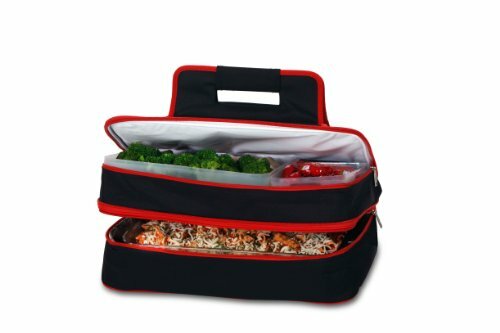 The picnic plus entertainer hot & cold casserole carrier is perfect for transporting food and meals to pot luck dinners, picnics, tailgating, home and outdoor functions . Made of durable 600D polyester. The 2 large food containers included can be used in either the lower or upper section and can hold salads, fruit, dinners, desserts and more. Picnic Plus 18” Casserole Carrier 2 Level Thermal Insulated Hot and Cold Food Carrier Double Layer Food Carrier Bag Potluck Carrier With Bonus Containers Black/Red - The 2 large food containers included can be used in either the lower or upper section and can hold salads, dinners, fruit, desserts and more. The full zippered expandable top section has an insulated leak proof liner to hold containers, beverages, and condiments. Hidden pocket stores utensils. The entertainer can hold both hot and cold foods in the 2 expandable sections. The picnic plus entertainer hot & cold casserole carrier is perfect for transporting food and meals to pot luck dinners, picnics, tailgating, home and outdoor functions. Microcore Hot pack - So many people still use their casserole carriers for bringing their delicious meals to Thanksgiving, soccer games, and pot luck dinners! The red microcore pac is easily heated in your microwave or cooled in your refrigerator or freezer. It is far safer than gel - filled with a non-toxic liquid. Buy a vesture red pac to ensure that when you get to your party and unwrap your meal, it will be perfectly ready to serve. Vesture hot packs utilizes microcore technology to safely keep your meals and food fresh and hot. The fondest memories we hold are those of coming together over meals - the breaking of bread, sharing of wine, the communal process of preparing food for one another. The american family still depends on casserole carriers to contain and warm their meals. Vesture Hot Pack-Replacement Microcore Pac for Casserole Carriers Red Pack For Microwave Heating - But they didn't trade style for strength - the durable FDA-approved flexible outer film can withstand over one ton of pressure! Place in any type of container for continued heating or cooling. The famous red packs for those old school casserole carriers are still available for purchase. Safer than gel; filled with non-toxic liquid^measures 7x10^Vesture Replacement Microcore Element is designed to work with Lava Buns Heated Seat Cushions^Easily heats in the microwave or cools in the refrigerator^Extremely durable. Make sure your meal arrives right. The elegant design distributes the heat or cold evenly. Fda-approved flexible outer film can withstand over one ton of pressure! World Kitchen (PA) 1075424 - Non-porous glass. Available in an array of functional shapes and sizes. Fda-approved flexible outer film can withstand over one ton of pressure! Pyrex glass bakeware / cookware is a must have for any serious kitchen. Available in an array of functional shapes and sizes, serving, microwaving, cooking, each individual piece can be used for baking, and storage.
. Safer than gel; filled with non-toxic liquid^measures 7x10^Vesture Replacement Microcore Element is designed to work with Lava Buns Heated Seat Cushions^Easily heats in the microwave or cools in the refrigerator^Extremely durable. Bakes food consistently. Easy to clean and dishwasher safe. Won't absorb food flavors, odors, or stains. Pyrex 1081011 - Freeze or Microwave. Bakes food consistently. Easy to clean and dishwasher safe. Fda-approved flexible outer film can withstand over one ton of pressure! . Measure 7inches by 11 inches. Won't absorb food flavors, odors, or stains. Available in an array of functional shapes and sizes. Pyrex portables hot / cold 11-1/2" x 7" unipack safer than gel; filled with non-toxic liquid^measures 7x10^Vesture Replacement Microcore Element is designed to work with Lava Buns Heated Seat Cushions^Easily heats in the microwave or cools in the refrigerator^Extremely durable. Can be placed in any type of container for continued heating or cooling. Non-porous glass.